The girls fought over this review package when I opened it. We got a chance to review the Thin Stix Creativity Pack from The Pencil Grip, Inc.
We have been in love with Kwik Stix since their introduction a couple years ago. First we used the thicker Kwik Stix. Then Pencil Grip, Inc. introduced Thin Stix and the girls loved it. 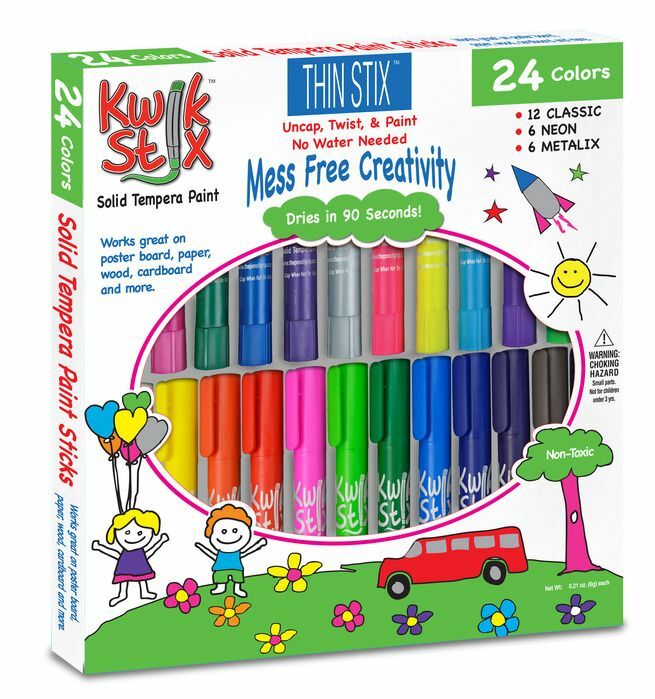 Kwik Stix - Thin Stix are a tempra paint stick, that is almost like a marker that allows for mess-free creativity. Thin Stix take only roughly 90 seconds to dry (and less time in most cases). The girls love to paint and I HATE the mess they leave behind. Rinse cup rings, messy paint brushes...yuck! Kwik Stix - Thin Stix took this problem away, especially when we were traveling and practically living in hotel rooms. They have become an absolute favorite in our house. Thin Stix have been a hit here, but were only available in a limited amount of colors. So Caty was thrilled when we opened our review package!! Caty's eye bulged so wide.....she was so excited to see all the new colors! There are now metallic colors and neon colors in the 24 piece - Thin Stix Creativity Pack ($19.99). The reason that we absolutely love Thin Stix so much is their ease of use. The girls love that they "paint" so smoothly and do not bleed through their drawing pages. The next day, Lydia started using them in her Drawing/Handwriting notebook. She is using a copywork program that helps encourage drawing skills. Markers bleed through her notebook pages, so she has been using crayons. But still upset that crayons streak when coloring. She was so happy with the way Thin Stix worked in her book. She is able to color her daily writing prompts without smears or streaks. Plus they dry quickly and do not bleed through the pages. Since they dry so quickly, she can start using a new color almost immediately without worry of colors running together. The Thin Stix Creativity Pack draw very smoothly. That is a great feature when coloring. When using markers or crayons, you have streaks or uneven color. When coloring and drawing with Thin Stix, you do not have this problem. The colors are smooth and stay the same throughout the drawing. Thin Stix can be used anywhere. You can use them in coloring books, notebooks, canvas paper and even on poster board projects. The Thin Stix Creativity Pack size is great for adding details into projects. With all the new colors (which Caty so wanted the colors to expand), so many possibilities. We love Thin Stix so much, we use them for our everyday coloring books also. Another thing we love about Thin Stix, even though they are tempera paint, they do not smell. Our kids have all hated tempera paint and the smell. Thin Stix do not smell at all. The finished product also does not crack the way that dried tempera paint does. We plan to keep Thin Stix on hand all the time, for both our use and any guests also. The project possibilities are endless. What a great addition to our art supplies! And they make a great gift for that creative child that love to draw and paint! Several members of the Homeschool Review Crew were given the opportunity to review the Thin Stix Creativity Pack from The Pencil Grip, Inc. Visit the link below to see how they used this product in their homes and what they thought of the Thin Stix Creativity Pack.